Plymouth is to get 31 brand new buses in a £5million investment by Citybus as a number of bus services are withdrawn and others are increased. The new buses being introduced in September will be operating on route 50. The buses will be yellow under the brand of YellowFlash and will include the same features as the current Flash fleet. From September 20 bus passengers on the Redflash Service 21/21A will see the frequency on the route, which includes Plympton and St Budeaux increase to up to every 7 minutes, from the current 10. The route will have an increased number of buses all running under the RedFlash brand. From this date there will also be in increase in direct bus services between the city centre and Derriford Hospital, increasing from up to every 15 minutes to up to every 10 minutes, with a service up to every 30 minutes continuing to provide a service to Woolwell. 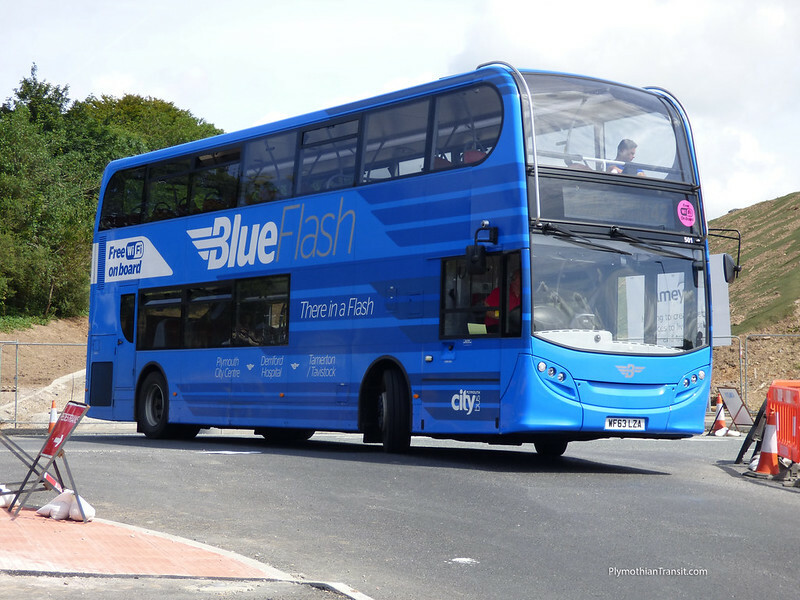 All direct buses from the city centre to Derriford Hospital will operate under the BlueFlash brand. To enable the above changes reflecting passenger need services 4/4A and 45 will be withdrawn from service, along with service 42 finishing at Derriford Hospital and not continuing onto Tavistock. 7 New ADL E400 due later in the year, will probably be in a ‘Flash’ livery although the colour is yet to be confirmed. 13 New ADL E200 due later in the year. Its likely that these will be in standard swoop livery but that may could change. All of these will be the older design Enviros rather than the new MMC which although they look a lot smarter, do cost quite a bit more, so while the older models are available it makes sense to keep buying them! Meanwhile, the BlueFlash Enviros 501-504 are currently being repainted into Red Flash livery for the increased service as detailed above. The revised 42 which will now serve Derriford, Tamerton Foliot and Woolwell will be all single decked using the Volvo B7RLEs with a few of the red ones being repainted blue. Although these changes reduce the wasteful competition between Citybus and Stagecoach, there will still be competition between the two especially on the City Centre Derriford corridor with the increased 42, the new Stagecoach 1 and at peak times the new Park & Ride services come into Derriford too. These will all be for use in the City so will be full sized. At a guess, these will replace more of the now elderly Dennis Dart`s. Why would you think small buses are required on the 72? We have full standing loads on citaros, and frequently leave people behind when they send a mini optare down there, just because it may not leave Plymouth full, don't forget it's a long route serving Lord of communities. the extra buses on 21 21A are nothing to do with stagecoach as they are not in competition with them. They feel with the 3 coming off there will be more demand on the 21 21A. The extra buses should also help reduce delays inbetween buses on this very busy route. I have no idea what you mean by your last sentence - but if you are expecting stagecoach to run for free on a route they have not registered then you may be disappointed. If SC wanted to go to Barne Barton then they would have registered the routes. They didnt. So are Citybus finishing in Ivybridge then? I see the 45 is coming off, so I'm guessing the 20A may come off too? Also, if they're getting rid of some of the older SLF Darts, why did they spend all that money on doing them up and re-respraying them? 20A continues for the time being at least. We dont know what buses will be replaced, the older Darts and the older Volvo B7TLs are most likely to go. Not that many of the older Darts have been repainted/ refurbished so those that have may well outstay those which haven't so money spent on them wont be wasted. That is brilliant.. Now please Stagecoach bring back the 3,3a and more buses through Mutley!! sorry to burst ya bubble. the traffic comissioner rejected it. scsw had to have support which was not offered. Anon 21:14 - what do you mean? The TC can't 'reject' a commercial service unless it's submitted as 'short notice' application without a valid reason. I think that is what they meant - the "support" would usually be a council agreeing that it supports the reasons for a short notice application. Thanks Anon 11:18 - must have missed that one as its clearly been updated. That makes things a bit more fun! Very odd that it is still shown as a new registration but is obviously a variation. I think a lot of us have missed that. I can only find it under the 15/7 new registrations (as opposed to variations). It doesn't come up if you search for registration #236 and nor is it in the complete list of Stagecoach Devon registrations as they jump from 235 to 237. Stagecoach not running to Saltash was always rather odd (far more so than not running to Torpoint), so this does make a lot more sense in making the jigsaw that bit more complete. So does that mean the Red Flash will get Wi-Fi considering the Blue Flash E40D's already have it fitted. Competition – In general business you are taught to research a unique product or service to offer to your selected customers. You look for a gap in the competition. If you have an ice-cream van you don’t park it next to another one. You may choose to park close by or somewhere different or swap for a burger van. You don’t do head to head competition. History – Today is the sum of the history of the universe; tomorrow will be different and your choices today will be part of that difference, but you are starting today and you can’t change that. Saltash – In history Citybus were not allowed to operate outside the city boundary and thus to Saltash and so the National Bus Company ran the interurban services, including Saltash. Deregulation and privatisation changed the rules. The rise and fall of Western Greyhound provided an opportunity which Citybus used to create Go Cornwall. Citybus now run 9 buses an hour from Royal Parade to Saltash and who is going to compete with that? What could anyone offer that would be different and make money. Stagecoach, like the other big operators, has a unique business and they will not compete directly with anyone, unless there are special reasons. Megabus and National Express are not the same. Stagecoach Devon runs a network of inter-urban bus services across Devon plus Exeter City services and a few local routes. Plymouth makes a good addition to the network as a base, as a destination and as a source of customers. In the future one could expect a Dartmoor network and services like Plymouth to Barnstaple, Tavistock to Exeter and Bude. Stagecoach running Plymouth local routes is unlikely, unless it compliments their inter-urban services or some special reason; For example compare First and Stagecoach in Portsmouth. Southampton is like the old Plymouth with First as Citybus and Go-Ahead as interurban. Citybus can now see a more stable and profitable future in Plymouth and can thus invest in a better product to expand the business; newer buses, more buses, more routes, more hours. Look at First in Bristol where they keeping adding frequency and 24/7 operation – routes that never go below every 30 minutes 363(?) days a year. The competition comes from the car more than other bus companies. The bus in the picture above (501) is in the spray shop already, being sanded down ready to turn red! Anyone know what else is in or what has just come out? At the moment the new buses are not set for Torpoint services. I suspect 'redundant' First drivers to be used to maintain the present establishment of drivers. The economy is picking up now and some companies are reporting shortages of drivers. It is the non driving staff who I feel sorry for, those who don't have licences who either get relocated to Exeter/Cornwall or made redundant as part of the sale. Stagecoach will first remove non driving roles (anyone outside of Operations or Engineering) in any takeover. Stagecoach has a keen eye for cost control and will know exactly where to make savings in a taken over business. Removing head office overhead without replacement will mean those costs are saved. This as part of wider measures can bring a loss making business into profit quite quickly with no loss of bus services to people. Do we know who will be operating the council tendered services 48 and 49 now? 48 was First but not registered by Stagecoach, 49 according to the Citybus website (https://www.plymouthbus.co.uk/news-service-updates/upcoming-network-changes/) the 49 is not being run by them from 20th Sept. New operator or no service for Wembury and Heybrook Bay? First have never made a loss in the last 20 years under first group, however PCB have been making a loss since they were sold to Go-Ahead, not only that customer satisfaction has never been higher at first compared to the 1% customer satisfaction that PCB get, time for PCB to give up & walk away from Plymouth before there shut down by a local boycott of everyone in Plymouth who constantly fed up of being RIPPED OFF!!!!!!!!!!!!!!!!!!!!!!!!!!!!!!!!!!!!!!!!!!!!!!!!!!!!!!!!!!!!!!!!! so why are First selling up and PCB buying new buses? Surely it should be the other way round if you are correct. So if PCB give up and Plymouth's bus service offering amounts to just a hand full of main routes run by Stagecoach (or whoever), charging what fares they like, how is that going to benefit the traveling public of Plymouth, its economy and its ability to attract businesses to invest in the city with its roads grid locked as a consequence of the loss of bus services? Answer is it won't, be careful what you you wish for. I use a monthly PCB ticket and it works out to less than half the price of driving my car to work, so I don't feel ripped off. That's everyone in Plymouth minus one that are going to boycott PCB, some how I don't think I'm alone in this. There are no driver redundancies despite all the rubbish posted here previously. The staff were told yesterday at the meeting with Stagecoach. then that is good news. This (Anon. 15.03) would seem to make a lot of sense. I imagine that Plymouth will become just one more depot of Stagecoach Devon with all local management functions concentrated in Exeter - which already looks after operations in Exeter, Torquay and Barnstaple. I presume First management staff in Barnstaple just lost their jobs as the company closed down rather than being sold. Plymouth is different as the operation here has been bought, staff and all. No doubt some of the more senior staff have already been offered jobs elsewhere in the First group; the others will be TUPEd to Stagecoach who may keep a few in Plymouth, offer some others similar posts in Exeter and, I am afraid, make many redundant. That is my understanding of the situation and of the way employment law works - but maybe someone who is personally involved can set out the actual situation for First's administrative and managerial staff. I suspect it depends on what Stagecoach bought.... Plymouth depot is my guess - so they would take on drivers plus depot engineering and admin staff under TUPE. However, the Head Office function will have been distinct, and of no interest to Stagecoach. First will presumably offer some/all the opportunity for HO staffto move to their new Head Office for the region - wherever that is - albeit probably smaller than currently. The rest or those who don't want to relocate will I guess face redundancy. However, this is my guess, and not based on any knowledge. Where is First's new regional HO? And likewise legal lettering address? Customer service address for First Kernow is Southampton offices, but Buses of Somerset is Taunton Bus Station offices. Will the region be merged with Hampshire as its smaller now? What you mean is you don't know. Of course some people know. You don't know because to put it bluntly, it's none of your business. There are no redundancies. All drivers are required by Stagecoach. First have a regulatory duty to maintain all services until their registrations expire. In any case First and Stagecoach obviously have an agreed plan in which Stagecoach will have set out things like how the want driver recruitment. I do know the answer regarding recruitment but as I said, it's not really the business of anyone outside of those in the two companies who need to know. I see it's been reported on another group that in September Stagecoach's Plymouth depot will take over the Megabus diagrams currently operated by Hamilton Gray. Exeter is better placed for the current diagrams but there's nothing to stop Stagecoach rejigging things and running more coaches in service to Plymouth or sending extra ones down into Cornwall. Or indeed if any diagrams currently operated by Cwmbran or Rugby will get incorporated. Time will tell. With the withdrawal of First 2 and Citybus 4 /4A it seems that Oreston will have no service from September as Stagecoach 2 appears to go via Pomphlett Road and Pomphlett Close. Does anyone know if this is correct? Traveline timetable / maps for the 2/2A seems to show that, even though it says blocked until confirmed (Was the 2 mis-registered as just First 2 and not First 1+2?). Traveline South East (my favorite site) seems to have all the new timetables. Tavistock looses it last evening bus and no Sunday service to Plymouth Station. Gold moves 2 buses to Plymouth and the X38 1 bus, both by withdrawing early journeys to Plymouth and evening returns - straight cost cutting. Oreston - could this be space for a new Target Travel service? See Citybus revision for 5/5A from 20th Sept. 5A will be via Oreston Rd. 5 will be via Billacombe road. However 6th to 20th seems to be a gap. From 20 September service 5 will be serving Plymstock School and Fairway Furniture and the 5A Oreston. is it true about the new 42c running to woolwell and the 42 only going to derriford? Yes from 20th Sept - 42C starts 6 Sept. The timetable is on Travelinesoutheast.org.uk (covers all the South and Midlands) - go to Find a Timetable - enter route number and Plymouth and you get a list of 42/a/b/c for current, 6 sept and from 20 Sept - click as required. All the PCB changes and Stagecoach routes are there too plus maps, both online and pdf files. All is now revealed on the Citybus web-site - with, for me, one worry and a couple of questions. The worry is on the Callington service 12 as it looks as though, with the withdrawal of the 76, St. Dominick will lose its morning and evening service to and from Plymouth. If this is actually used by St. Dominick people to get to and from work in Plymouth, I wonder if Cornwall Council will put a replacement out to tender. It would appear also that the 12 to Callington is being reduced to hourly - no surprise there. (i) Does the route alteration to the 10 in Saltash, looked at alongside the Stagecoach 2, leave any lengths of road unserved? (ii) Assuming the 45 has gone because anyone in Ivybridge in a hurry can use Gold, are people from the estates in Ivybridge who get on to the 20a going to have a tour of Woodford on their way into Plymouth? Summercourt isn't First a Devon and Cornwall's 'new HQ'. Yet more rubbish posted here. buses of Somerset and First Kernow are more self contained after Plymouth closes and there are only a handful of senior staff left who use offices in all areas anywhere. FDC isn't into head office structures. The new registered address will be Camborne.